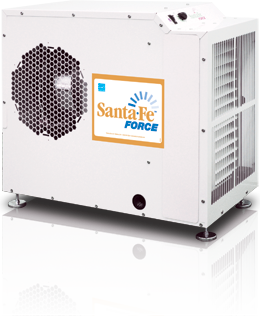 Size: 1.75" x 14" x 17.5"
Went with Santa Fe because friend bought one and after 18 months the compressor failed. He called the company, and they replaced it completely, no charge. Good company it seems. Quiet, cannot hear it with the HVAC fan on constantly for summer season humidity. Ducted it to remote bedroom for circulation. Recently closed my crawl with CSR products. Added the dehumidifier a couple weeks ago and since then it has been raining with outdoor humidity levels up to the mid 90's. The Force has reduced the humidity readings to the mid 40s in my crawl at the high normal setting. The noise level is acceptable and it cycles on and off. Previous humidifier could not get the 3000 sf crawl below 55% despite running constantly. Had a power outage and the unit restarted itself as advertised. Very pleased thus far.